An AWOL soldier, Private Witt (James Caviezel), had never been good at following orders. When ordered to go left, he turned right. But when he was found in a Malaysian island by 1st Sgt. Edward Welsh (Sean Penn), Pvt. Witt, as punishment, was assigned to be a stretcher bearer in the Battle of Guadalcanal. The attack was led by Capt. James Staros (Elias Koteas) and his superior Lt. Col. Gordon Tall (Nick Nolte). The former wouldn’t obey the latter’s orders because he believed that sending his men forward was suicide. The Japanese bunkers were too far and too hidden for a typical affront. Lt. Col. Tall wasn’t convinced. 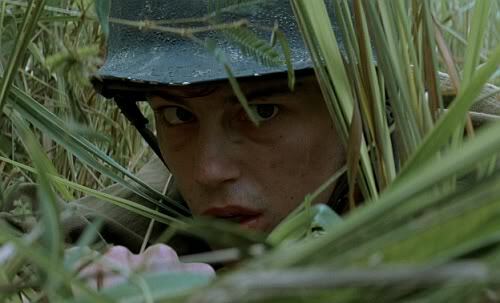 Based on the autobiographical novel by James Jones and beautifully directed by Terrence Malick, “The Thin Red Line” was fascinating because it combined the horrors of war with spirituality. We were given the chance to hear a soldier’s thoughts, American and Japanese, about his place in the world, trepidation in terms of facing his mortality, and the loved ones he left behind. While the action scenes were raw and unflinching, I was most impressed with the way the soldiers played the hand they’ve been given. Some made rookie but dire mistakes out of panic (Woody Harrelson), some succumbed in fear and would rather be invisible (Adrien Brody), while others were distracted by flashbacks, wondering whether someone was still waiting for them at home (Ben Chaplin). The film highlighted that war was not as simple as two sides fighting for a cause. In a way, the battlefield was a glorious arena in which we had to fight ourselves. While good soldiers trusted their instincts, orders, too, must be obeyed. The conflict between instinct and duty could break a man. I was most interested in Pvt. Witt because he looked at his enemies with serenity. Unlike his comrades, not once did he show hatred toward the soldiers on the opposite side of the mountain. I wondered why. If I was in his position, I’m not quite sure if I could look at my enemies as if they were my equal. I would probably see them as lower animals and treat them as such. I just don’t think I can be as forgiving if I knew that my friends and comrades died because of them. Pvt. Witt mentioned that “maybe all men got one big soul everybody’s a part of, all faces are the same man.” Malick used images to underline man’s place in nature. There were zen-like shots of soldiers just sitting around and admiring, for example, a plant. It took them out of the situation, even for just a few seconds, until the voice of their leader urged them to go on. There were several shots of birds, flying in sky or dying on the ground, which symbolized either glory or pain. “The Thin Red Line” was sensitive and intelligent. It tried to find answers in a place where answers were as transient as they were permanent.